As of October 21st of 2013! 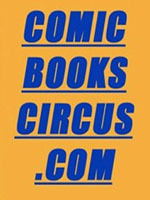 Yesterday I uploaded the new logo for my ComicBooksCircus.com web site, which is actually the 'New' account name for my eBay store. My thanks to Joe Pepitone (JoepeP!) for designing the new logo for me! Anyways, I've had an eBay account since January 20th of 1999, and started selling part time shortly after that. So it is nice to be recognized by eBay on receiving feedback from my 10,000th customer! The eBay store is on 'vacation' right now, but will emerge online again shortly after November starts. I'll be having a Grand Re-Opening at that time! NOTE FROM Michael D Hamersky On Comics: My thanks again to all of YOU reading this blog and our archived blog posts, now at 3,975 total posts in number! I do appreciate your continued reading and support of this Blog! TODAY'S FEATURE IS BLOG #3760 - This blog originally started off as an eBay Blog back in September of 2007. I haven't been posting that many blogs to or about my eBay online comic book shop this year, (even though the photos contain links to that shop). So when eBay sent me an email yesterday that all of my listings for this week would be 'Free'... I immediately starting listing more comics / graphic novels / DVDs, etc. yesterday. I still have more to list today, and probably tomorrow, auction style! However... There are other 'fixed price' store listings that are available right now for purchase, and I can ship those out right away. Please note: My eBay comic book shop will close as of Tuesday night, December 18th, so that I can ship out all the sales on Thursday. As we are on a vacation on Friday! And a Merry Christmas / Happy Holidays Season to you all! NOTE FROM Michael D Hamersky On Comics: My thanks again to all of YOU reading this blog and our archived blog posts, now at 3,760 total posts in number! I do appreciate your continued reading and support of this Blog! Then You Will Want To Take Advantage Of The Last Day Of The Two Days Event! Today, January 27th! TODAY'S FEATURE IS BLOG #3593 - Earlier this week, in blog #3589, I mentioned that I was celebrating my 13th year as an eBay Seller! Well... I'm sure it isn't because I've been with them for so long... LOL!, but eBay is having a two day Free Listings Sale that ends today! 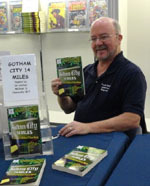 I was so busy yesterday listing items that I only had time to post a mention of that on my Facebook Fan Page, Michael D Hamersky On Comics, because I had already posted a special blog yesterday morning! So if you have any items that you want to sell, and have an eBay account already, you might want to squeeze in the time to upload a few auction listings! As eBay is allowing everyone up to 50,000 Free Auction Listings! That's a little out of my scope though! I usually have approximately 5,000 listings to upload at any one time, so I'll see how many of those I can finish uploading today to take advantage of this 'Free Listing Sale'! Here's the direct link for you to click to see how you can take advantage of the sale also! And now.. it's back to my own listings! And yes, those listing will be uploaded to my ComicBooksCircus.com domain name, which is my eBay online comic book shop! Just consider this blog post today to be my PSA (Public Service Announcement) for the day! NOTE FROM Michael D Hamersky On Comics: My thanks again to all of YOU reading this blog and our archived blog posts, now at 3,593 total posts in number! I do appreciate your continued reading and support of this Blog! BTW, You can 'follow' this blog by clicking the 'Follow' Button at this NetworkedBlogs app link! We currently have over 2,684 'Followers'! Thanks to ALL of YOU that have already clicked that button! And for those of YOU that haven't yet... I would appreciate it if YOU would!!! 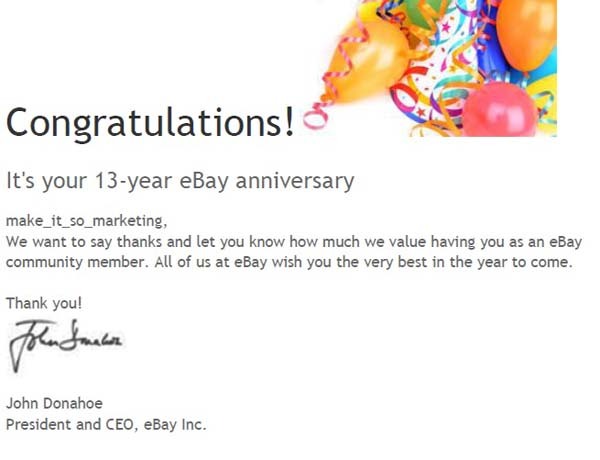 It's A Happy 13th Anniversary Greeting To Michael D Hamersky From eBay! With A Letter From eBay! Start Date Was January 20th of 1999! ********@hotmail.com & make_it_so_marketing during those 13 years! TODAY'S FEATURE IS BLOG #3589 - On Sunday afternoon I received an email from eBay congratulating me on my 13 years of being an eBayer! The main reason I joined back on January 20th of 1999 was that I wanted to test the sales market for comic books that I had in storage, and was only selling via mail order. You see, I had stopped setting up as a comic books dealer after the big crash of the mid 1990s when comic book publishers flooded the sales markets with 'collectible variant covers', rebooted titles with new #1 issues, and other such nonsense. So I had some good comics left over from those earlier set up at cons days pre the crash, and decided to try selling them online via eBay. Which I have to admit here... I'm glad that I made that decision to do so! Sure, it has been an up and down 13 years on eBay, attempting to adapt to all of their required changes... Many of them coming month after month, back to back at times. Thank goodness those policies have stopped! Nowadays we have some time to adapt to changes, and plan ahead. And yes, even though I was a relatively early adopter, I still had to change my eBay seller ID when eBay decided that email addresses couldn't be used as a seller ID. Thus the change on December 23rd of 2003 to the seller name: make_it_so_marketing, which was my wife's new incorporated business name. It made total sense to sell under that new ID name, so gradually the advertising and feedbacks would state something similiar to: "Thanks for letting us Make It So for You!' or other similar slogans! 1) Would be attending the eBay Live 2005 convention in San Jose. It was a great convention, and really opened my eyes as to what could be done with this sales avenue. Plus eBay knew how to throw a party! One photo of that week's conference is shown at the top right of this blog post! 2) My decision to start a blog via the eBay program on June 7th of 2006, which ended up with me winning a $100 prize for doing so! I soon realized that for me to to link to non-eBay urls that I had to start a non-eBay blog, which is what you are reading now. Which was doubly smart, as eBay closed down 'their' blogging platform during Halloween of 2009! Anyways, I'm pleased to receive some recognition from eBay as being an eBayer for 13 years now, and hope to continue with them for additional years! And yes, my ComicBooksCircus.com domain name will still re-direct to my eBay comic book shop, although I am opening up new sales avenues in 2012! Also, although I am not as socially active as I used to be on eBay, due to their closing down of the blogs platform, and that the 'neighborhoods' was an idea that didn't take off, I'm still semi active on the remaining two groups that I'm a member of there. I do post photos about eBay topics at my special eBay Topics photo album at my Facebook Fan Page, as seen here! 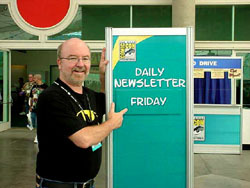 NOTE FROM Michael D Hamersky On Comics: My thanks again to all of YOU reading this blog and our archived blog posts, now at 3,589 total posts in number! I do appreciate your continued reading and support of this Blog! BTW, You can 'follow' this blog by clicking the 'Follow' Button at this NetworkedBlogs app link! We currently have over 2,679 'Followers'! Thanks to ALL of YOU that have already clicked that button! And for those of YOU that haven't yet... I would appreciate it if YOU would!!! Thanks To eBay... Year End Clearance Sale Going On At ComicBooksCircus.com! Thanks to eBay, There Is A Year End Clearance Sale At ComicBooksCircus.com - The BIG TOP of Comics! Pics this column: The logo for ComicBooksCircus.com - The Big Top of Comics! - and The Circus Train Is Coming to Town - Plus A Half Dozen Elephants are here to help move the comics / magazines / DVDs / toys / books / out for the 2011 Year End Clearance Sale! 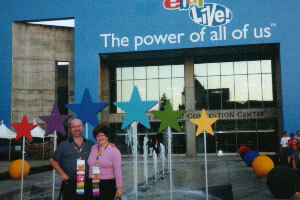 Top Photo Left Column: Michael D Hamersky & Tina LoSasso at the eBay Live 2005 event in San Jose! ComicBooksCircus.com is taking advantage of the three day listing sale for auction listings that eBay is running December 27th - 28th - 29th! How? By listing auction listings starting at only 99 cents on up for auction listings that are ending three to seven days after they are listed in the eBay Store that ComicBooksCircus.com's domain name is re-directed to! So from December 30th (tomorrow!) through January 5th, YOU can take advantage of this listing sale! Of course you can preview the auction listings right now, as they are 'live' at ComicBooksCircus.com! Please note: There is a 'shipping special' for raw unslabbed comic books! $3.95 S&H is all that I ask for shipping 1 to 100 comics to USA addresses. I repeat: $3.95 S&H for raw unslabbed comic books only! No CGCd slabbed comics for this shipping special. Also, if you 'mix' comics with graphic novels, books, toys, DVDs, etc., I can still combine shipping, but the S&H charge would be more, as they are odd shaped with different page counts. The total weight is usually heavier, and I have to use odd sized shipping boxes or envelopes to ship them. Please message me through eBay's message program for S&H costs! Also, due to a fraudulent claim with PayPal earlier this year, I no longer ship outside of the USA anymore, UNLESS the potential buyer pays for a shipping format that has tracking. That form of shipping unfortunately is very expensive, so shipping inexpensive comics out of the country just isn't cost effective normally for the buyer. I only ship via USPS, and the most current rates are shown at a special note page within my Facebook Fan Page for 'Michael D Hamersky On Comics'. Again, my apologies for the higher shipping charges shown there, but I can no longer afford to ship using PayPal as payment without abiding by PayPal's policy on chargebacks, after that major fradulent claim from a buyer in Argentina. However, for those of YOU that are in the USA, or are in Canada or Mexico with access to a USA shipping destination, now is the time to purchase those items you are missing from your collection, or didn't buy when they first came out to read! Again, this is the link to ComicBooksCircus.com, where I invite you to shop our Year End Clearance Sale that is happening right now, thanks to eBay! I hope you are enjoying the holiday season... Soon it will be 2012! My thanks again to all of YOU reading this blog and our archived blog posts, now at 3,573 total posts in number! I do appreciate your continued reading and support of this Blog!